The Boston Bluegrass Union's (BBU) 37th concert season continues on Saturday, January 14th with Russell Moore and IIIrd Tyme Out at the National Heritage Museum in Lexington, MA. We're huge fans of this band and it should be a great, great show. IIIrd Tyme Out is a long-time favorite of Boston audiences. Winner of an unprecedented seven consecutive Vocal Group of the Year awards from the International Bluegrass Music Association, the band balances soul and precision to create bluegrass that is contemporary and timeless, exciting and emotional. They dazzle audiences with tight instrumental work, classy song selections, and, mostnoticeably, thrilling lead and harmony vocals. 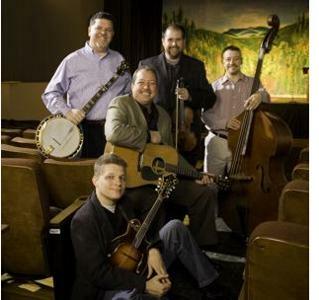 Featuring Russell Moore, the 2011 IBMA Male Vocalist of the Year (guitar), the band includes longtime members Wayne Benson (mandolin), Steve Dilling (banjo), Edgar Loudermilk (bass), and Justin Haynes (fiddle). IIIrd Tyme Out has just released Prime Tyme on Rural Rhythm Records. In just a short time, the project has met with great success. "Pretty Little Girl From Galax" is the #1 single on Bluegrass Today's Weekly Chart (12/2/11), #3 on SiriusXM Radio's Bluegrass Junction Most Played Tracks, and #6 on Bluegrass Today's Monthly Airplay chart. The first single release, "If Your Heart Should Ever Roll This Way Again" climbed this month to reach the #7 spot on Bluegrass Unlimited Magazine's Top 30. Have a listen here. Tickets are $26 (BBU Members $23) and can be purchased online at www.bbu.org or by mailing a check (payable to the BBU) with self-addressed stamped envelope to Boston Bluegrass Union, PO Box 650061, West Newton, MA 02465. The National Heritage Museum is located at 33 Marrett Rd. (Route 2A), Lexington, MA 02421. Doors open at 6:30pm and concert begins at 7:30pm. Directions can be found at www.monh.org or call (781) 861-6559.